1. Say what you want, without expecting to get it – The Power of ‘I Want’ from Growth Journal. This is a beautiful, insightful blog about personal growth. This post impacted me a lot because one of my biggest flaws is an inability (or unwillingness) to say what I want or need, for fear of seeming selfish or entitled. This post made me realise I need to give myself permission to communicate what I want. It doesn’t necessarily mean I always expect to recieve what I want, but it can be validating and empowering simply to give it a voice. 2. Self-perception is everything – Change how you see, not how you look from Drawing My Own Conclusions. I adore the hand drawn pictures that accompany the thoughtful words and affirmations in this blog. This is a gorgeous post about accepting yourself and your situation completely. 3. Asking for help is not selfish – Asking for Help When You Need It from 1000 Mitzvahs. This blog is Linda’s journey to perform 1,000 mitzvahs or acts of kindness in memory of her father. Asking for help always seems like placing a burden on someone else, but this post made me realise that sometimes its actually a kind thing to do not only for yourself but for someone else who is made to feel needed and giving. 4. Find the balance between kindness to self and kindness to others – Lessons in Generosity from Smile, Kiddo. This blog is all about finding happiness in, and gratitude for, the little things in life. I could relate to this post very easily because I know all too well that giving too little can make you feel guilty and giving too much can make you feel resentful. But those emotional reactions are just your instincts trying to guide you towards finding the balance. 5. Experience all the seasons before passing judgement – The Seasons of Life from Happiness is a Lifestyle. This blog is Lexy’s personal journey to create more gratitude, inspiration and happiness in her own life. I really loved this post which encourages us to make sure we don’t judge a person or situation after seeing only one, negative side. Seeing a tree in winter does not give any indication of its beauty in spring. 6. Don’t talk change, make change – What If … from Resolve to Give. This blog is about Eric’s pledge to keep the giving spirit of Christmas alive all year long. It’s inspiring to read about how he is actively living out the change he wants to see in the world. 7. Give yourself more credit and remember the big picture – Doing Something Right from Bye Bye Bitters. This blog is an honest, funny, thoughtful account of Helena’s quest for happiness and self-acceptance. This post is a reminder of how we can all be our own worst critic and come up with a million ways in which we aren’t “good enough”, but really when we look at the big picture we are probably doing a lot of things right. 8. It takes time and effort to create consistent happiness – Lost My Way from Cure My Toxic Mind. A blog about one woman’s journey to free herself from negative thoughts. Even when we know in theory that happiness is created and not found, it takes time and dedication to learn how to put this into practice. 10. Accept nothing less than a fabulous life – I can deal with aging but I can’t dig an ‘average’ existence from The Fab Life Project. This is an amazingly motivational blog that challenges us to question everything and develop an unwavering self-belief that we deserve to live our best life. Aww, thank you for included me in this awesome list (yay for new blogs to read!) – I’m honored! You’re welcome. Yes, yay to awesome blogs and finding so many people on a similar journey to happiness and positivity! Thank you Catherine! It’s much appreciated! You’re welcome, Eric. Keep on giving! You’re welcome Stef! You deserve it. I am beyond thrilled to be included, and I can’t wait to read the posts your recommended. Awesome! Thanks Amber. They are all fantastic, well worth a read! You’re welcome. I will have to do a post about all the awesome food-related blogs out there one day too! 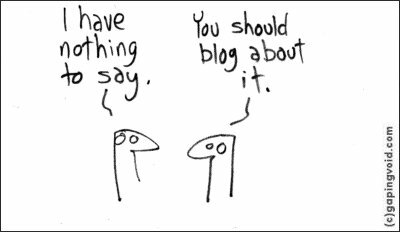 I know, the world of blogging is a little crazy when you first dive in – I’m still not too sure about all the widgets and feeds. Oh I love a good happy dance (clearly), and love even more the idea that I prompted one from someone else! Your blog is great, keep it up. This list is exactly what I need this week! I especially like #4 and #8.